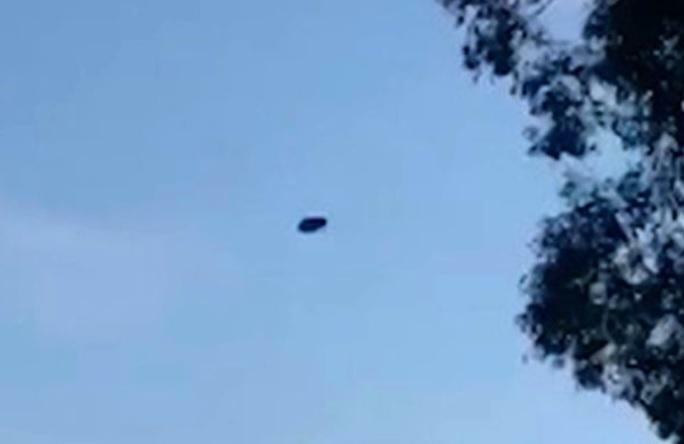 A motorist leaving a Melbourne suburb was shocked when she saw an object floating in the sky. Junelyn Bitalac, 22, got out of her car as she was driving near a military base and filmed a disc-shaped object hovering in the sky. Bitalac said she noticed the black object hovering in the sky and pulled over to get a closer look. She described the object as a disk approximately 16ft (5m) in diameter and it was traveling at a high speed through the clear blue sky. Bitalac is a mother and personal care assistant and she followed the UFO's path with her footage as it passed over power lines before disappearing into the distance. People online were quick to point out how close Hastings is to a naval military base HMAS Cerberus on the Mornington Peninsula. Bitalac said, "I really do believe in aliens and extra-terrestrial life so I was quite amazed to spot what I saw - that's why I pulled out my phone straight away. I was just randomly looking into the sky while I was driving and noticed the strange round object, so I decided to pull over and film it." "I have never seen anything like it and have no clue what it was," Bitalac continued. "But it is very interesting that I spotted it so close to a military base. Everyone who has watched the clip said it was very unusual. It was after I dropped my mom to work and I was on the way home, so I was just by myself that time. I had no idea where it went after I filmed it because I got distracted by the car approaching towards me." Bitalac moved to Australia from the Philippines in 2010 and said she didn't realize how close her sighting was to a naval base until commenters online pointed it out. It is also not the first time she has seen a UFO. "This is not the first time I have spotted a UFO," she said. "Another time about three years ago I was in Carrum Downs when I spotted three triangular-shaped objects moving very quickly overhead, but they disappeared before I was able to film them." New trick is to mount a UFO cardboard cutout to a Drone.